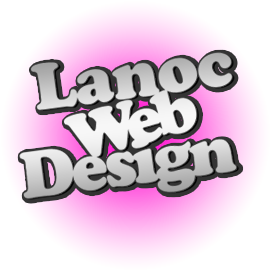 At Lanoc Web Design, we are finding that local businesses are trying to use cheap online website builders but are growing increasingly frustrated with the experience and lack of service. A common call to us is from a potential client who finally realizes, they either don’t have the time to create their own website or they can’t get the personal help they need in the process. Contracting with a cheap online website builder may incur a lower cost of your website design project since these bulk providers develop thousands of website’s for businesses all around the world. Because they’re working in quantity, they can charge lower fees. The downside of their service is low quality of customer support, little control of the finished website you receive and poor performance on the search engines (Google, Yahoo, Bing, etc.). A local web design company, on the other hand, will provide a better level of service because they can visit your business to meet you on a personal level. They can also learn more about the services you provide or products you sell. A local web design company will know who your customers are and how your website can serve them. They are a local company: This is obvious and needs to be stated again as the number one reason. You will meet the design team you’re working with in person, plus they know your community. They will help create unique content for your website: Site builders for specific industries such as real estate, restaurants and auto dealers can contain duplicate content (text and graphics that already exist on another website in your same industry). Duplicate content negatively affects a website ranking in the search engines. A local web designer is going to be sure your content is unique. They know your local community: Your web designer lives in your community and has a strong understanding of the area which should help you capture the local search market. Promoting your business locally: Once your new website is complete, your local web designer will want to share the great job they did with business associates, friends and family. Choose a web design company that gets face-to-face with more local business people through networking and volunteer work. They will most likely promote your products and services, not to mention use your products and services. Your web developer will want to display a screen-shot of your website along with a link to show examples for future clients, giving more visibility and credibility to your business. You are supporting a business in your local community: If you choose a cheap site builder, you might be sending your money overseas to pay for your monthly website fees. If you choose a local web design company, you will be supporting a local, professional business. They are interested in the future of your online presence: Your local web designer is a resource for you when it comes to adding new functions, sending enews, making website updates and making sure your website gets indexed in the top search engines (Google, Yahoo, Bing, etc). At Lanoc Web Design we enjoy visiting a potential client’s place of business to get to know them on a more personal level, to get a feel for the business itself and to discuss the goals of the website. Our clients continually comment on the fact that they always feel comfortable discussing their website and email concerns with us. We are available by phone, we respond to email in a timely fashion and we make requested updates within 48 hours of receipt (depending on the complexity of the request).